A jury has found that Dr. Dre, Iovine and their headphone company Beats Electronics owe a former partner $25.2 million. 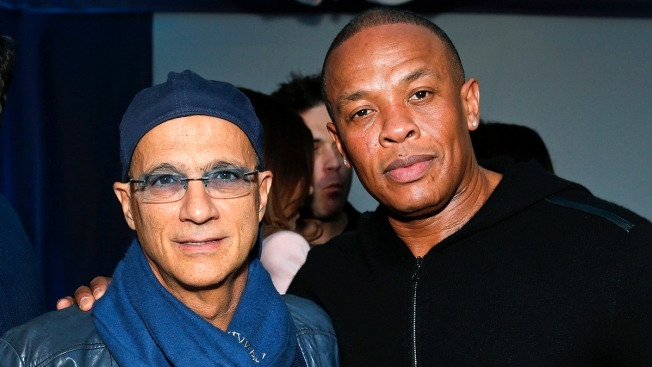 A jury on Wednesday found that Dr. Dre, music mogul Jimmy Iovine and their headphone company Beats Electronics LLC owe a former partner $25.2 million in royalties. The Los Angeles Superior Court jury found Wednesday by a 9-3 margin that Beats breached a contract with Steven Lamar and his company Jibe Audio. Dr. Dre and Iovine, the music producer and co-founder of Interscope Records, were not in court for the verdict. Both testified during the three-week trial and sat in the audience for opening statements. The suit said Lamar in 2006 came to Dr. Dre, whose real name is Andre Young, with the idea for celebrity-endorsed headphones. Attorneys for Lamar contended he was owed over $130 million for a dozen different models of headphones. Rapper Meek Mill has been in a decade-long legal struggle in Philadelphia's criminal justice system. The defendants acknowledged that Lamar was involved in initial plans, but argued he was only owed for one product, the original Studio model, and was already paid. "The jury really validated our theory of the case, that Mr. Lamar was involved in the founding of Beats," Lamar's attorney Stephen E. Morrissey said outside court. "It's not everything we were asking for, but we're happy." Lamar said the award could grow because of future sales of headphones still on the market. Beats attorneys declined comment outside court. A minimum of nine jurors had to agree to reach a verdict. The verdict, reached after three days of deliberations, did not break down separate amounts to be paid by each defendant. Beats, which added a music streaming service after its 2006 founding as a headphone company, was acquired by Apple in a $3 billion deal in May of 2014. The lawsuit was filed four months earlier and does not name Apple as a defendant. Apple representatives did not immediately respond to phone calls and emails seeking comment. The $25.2 million award is pocket change for Apple. Based on earnings in the past fiscal year, it generates that much revenue, on average, every hour of the day.